The oilseed industry has recently shown a growing trend in South Africa, with industry growth led by the soybean market. In its 6th production forecast, the Crop Estimates Committee has estimated that soybean production for the 2017/2018 marketing season could reach a record 1,3 million tons, while sunflower is estimated at 821 970 tons. Soybean production has grown significantly from the previous drought-stricken season, increasing by more than 80% from the 2016/2017 marketing season. Sunflower production has also shown substantial growth, with production expected to be at its highest in five years. While record production is good for industry growth and opens export opportunities, it also plays a role in deflating commodity prices. The current season also promises a record maize crop which has noticeably placed tremendous pressure on prices and furthermore makes profitability a challenge for producers. This has also been the case with oilseed prices, as prices have trended lower subdued by large supplies. With production planning underway for the new season, factors such as profitability, price risk and crop planning become a common concern amongst producers. Entering the new production season, farmers are faced with industry challenges such as lower commodity prices and rising input costs. It is important for farmers to understand the principle of price risk and profitability. Graph 1 indicates the profitability level of summer crops compiled using production cost budgets for average yield per crop from the North West Free State region and average 2018 Safex prices. From the graph it is clear that maize profitability is the lowest, which was mainly affected by large maize supplies causing prices to trade at export parity levels. Sorghum proves to be more profitable than maize, however, due to the tightness of the market, it is not ideal to plant sorghum without a contract. Sunflower and soybeans are the most profitable at an average of 1,8 t/ha, followed by groundnuts as the most profitable crop. Following onto the trend of a growing oilseed industry, particularly for soybeans in South Africa, it is clear that even at an estimated record crop of 1,3 million tons, that had an effect on lower soybean prices, soybean still appears to yield a better gross margin for the upcoming production season. It is also important to note that profitability differs from one producer to the next as well as for different regions where it’s planted. 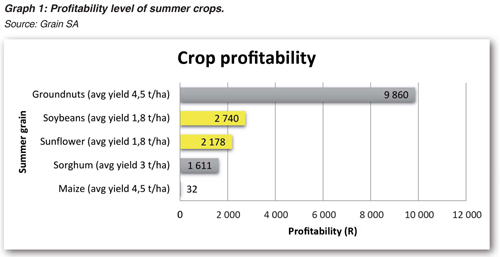 Based on the principle of profitability, it is expected that farmers could move to planting more soybeans in the future as opposed to other summer crops such as maize and sorghum. It is however important to note that as more farmers shift towards the soybean industry in the long run, this could result in lower soybean prices, which would subsequently place pressure on the profitability of the crop in future. Therefore, while farmers seek opportunities to remain profitable they also need to be aware of the long-term challenge of price risk in surplus production.